Web pages normally contain lot of advertisements, images, empty spaces and other junk data, so web printing could result in waste of paper, ink, money and not environmental friendly. Previously we have mentioned PrintWhatYouLike that serves as a free online editor to let you format web pages and only print on what you like to see, now there is another utility, named as Printee that works as add-on for Internet Explorer to allow you pick, edit and print web page according to what you like it to be printed. Printee is a web printing tool for Internet Explorer. Once you have gotten it installed, you will notice that when you right click on any web page content, an orange toolbox will be displayed on IE toolbar. This toolbox is called as IE toolbox which you can use those features available here to edit web page content to just what you like. Alternatively, you can display IE toolbox by clicking on green “Printee” button, which appears as toolbar button. If you don’t see the green “Printee” button appears as toolbar button, you can always add it by right clicking on IE toolbar and then choose Customize, under Available toolbar buttons list, look for IE Toolbox and then add it to the current toolbar buttons list. 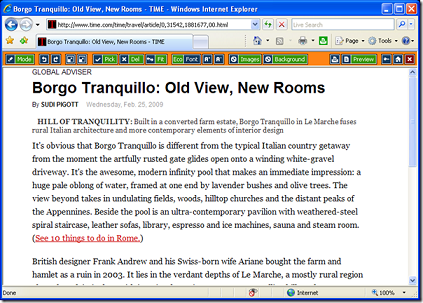 The IE toolbox contains features such as Pick to remain the selected area and other areas which are not selected will be disappeared, Del to delete elements of the selected area, Fit to adjust the contents of the current selected area to the appropriate width, increase or decrease font size, remove background and unwanted images, print preview and etc. Printee 1.5.1 is absolutely free to download and works well for IE6/IE/7/IE8. Consumes only 1.35MB of your hard disk space, the utility is compatible to run on Windows 2000/2003 and XP.